The Navy is set to deploy a salvage team in an attempt to recover missing sailors lost in the C-2A Greyhound cargo plane that crashed last month in the Philippine Sea killing three sailors, the service announced on Friday. A Washington, D.C. – based deep-water salvage team will use a specialized detector to find a locator beacon on the aircraft that crashed en route to the carrier USS Ronald Reagan (CVN-76) on Nov. 22. Of the 11 sailors aboard, eight were rescued. 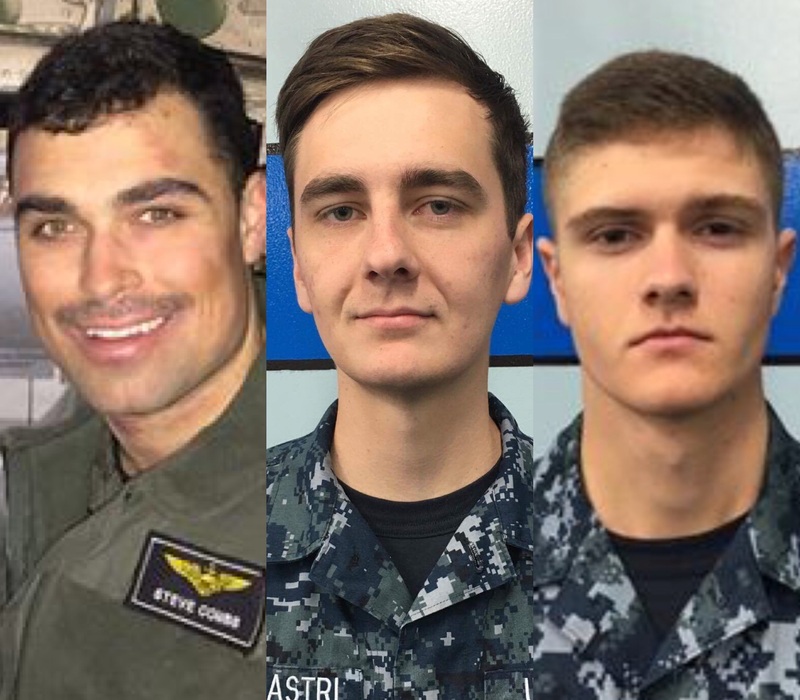 The Navy and the Japanese Maritime Self Defense Force searched for Lt. Steven Combs, Aviation Boatswain’s Mate Airman Matthew Chialastri and Aviation Ordnanceman Airman Apprentice Bryan Grosso for several days before declaring the trio lost at sea. The Greyhound was assigned “Providers” of Fleet Logistics Support Squadron (VRC) 30, Detachment Five, forward deployed at Naval Air Facility Atsugi, Japan. “The salvage team will embark a U.S. Navy-contracted salvage vessel in Japan and proceed to the crash site at sea. Once on station, highly skilled operators will search for the aircraft’s emergency relocation pinger with a U.S. Navy-owned towed pinger locator (TPL-25) system,” read the statement from U.S. 7th Fleet. The Navy deployed the TPL-25 as part of the failed search for the missing Malaysian Airlines Flight 370 in 2014. The Navy is currently investigating the cause of the crash. The service is set to replace the more than 50-year-old airframe design will be replaced in the 2020s. (left to right) Lt. Steven Combs, Aviation Boatswain’s Mate (Equpiment) Airman Matthew Chialastri, Aviation Ordnanceman Airman Apprentice Bryan Grosso. The following sis the complete release from U.S. 7th Fleet. 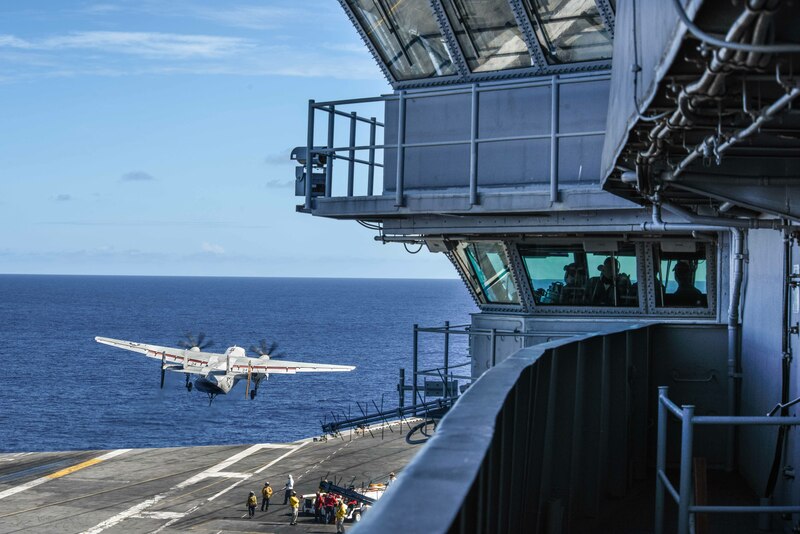 YOKOSUKA, Japan – The U.S. Navy will deploy a team of deep water salvage experts to search for the C-2A Greyhound aircraft that crashed in the Philippine Sea on the way to USS Ronald Reagan Nov. 22. While the aircraft’s last position on the surface of the water is known, the depth of water in that area exceeds 16,000 feet, beyond the capabilities of salvage assets in theater. In the coming days, a team of deep water salvage experts led by United States Navy’s Supervisor of Salvage and Diving (SUPSALV) will deploy from Washington D.C.. The salvage team will embark a U.S. Navy-contracted salvage vessel in Japan and proceed to the crash site at sea. Once on station, highly skilled operators will search for the aircraft’s emergency relocation pinger with a U.S. Navy-owned towed pinger locator (TPL-25) system. If the search is successful, additional deep water salvage assets will deploy to survey and recover the aircraft. Every effort will be made to recover the fallen Sailors. Assigned to Fleet Logistics Support Squadron (VRC 30) forward deployed to Japan, the C-2A aircraft was carrying 11 crew and passengers when it crashed. Eight personnel were recovered immediately by U.S. Navy Helicopter Sea Combat Squadron (HSC 12). For the next three days, Ronald Reagan led combined search and rescue for three Sailors with the Japan Maritime Self Defense Force (JMSDF), covering nearly 1,000 square nautical miles before ending the search. An investigation is in progress.